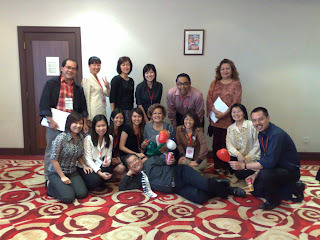 We have organized a wonderful training on 3 & 4 December 2008 at Crowne Plaza Riverside Kuching, presented by Nicholas Choo from Singapore, an inspiring and impressing trainer. Throughout the 2-day training, we can know more about ourselves and understand which character we are actually taking in working environment or daily life. Thus, after finished the profiling system, I understand more about myself and the way to handle my job and stay together with my colleagues. Went to Sungai Buloh, Simunjan, Sadong Jaya and Sebuyau with a friend on Haji Day to see his construction sites. Enjoy the trip, for me to have fresh breathing and eye on the green... Tiring to always stay at city environment, tiring to look at the computer for over 12hours everyday. I really need a break~ wondering when can I make it?